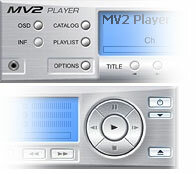 Mv2 player is freeware multimedia player for Windows, with tons of usefull features. For example inteligent subtitles detecting/loading; lots of multimedia, skins and subtitles formats supported; easy to use for begginers, and lot of settings for advanced users; fast keyboard control and unique comix and history feature. And this excellent player is small and for free! One of the best players ever created left at an RC2 version. That's really a shame. It has it ALL the features one can imagine, and still does its job very well on WindowsXP SP3 (apart from being a little slow at startup). Where have the creators gone? nice prog. but just a bsplayer copy. it uses more memory than bsp! I tried other programs such as BSPlayer & KoalaXP and many more, but this is the best so far, it's small, has A LOT of features/options, small, and it's free, what more can I ask for? should it dance too LOL. This is a great media player. It not only handles music and video files, but DVD and television (if one has the equipment). This is one of those programs that could replace two or three others. It has worked well with my old (8 Meg) ATI All-In-Wonder so far. And unlike Zoom Player, it's full function version is free (for now). The only problem I've had so far is in getting use to the interface and the playlist.